Wikipedia and other encylopedias (whether in print or online) do not qualify as scholarly resources. Encyclopedias are a good place to start your research, but not are generally not considered acceptable sources to cite. The collaborative and dynamic nature of Wikipedia presents a number of additional concerns regarding the quality and authority of the entries. See what Wikipedia has to say about this topic. 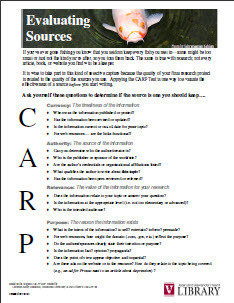 Finding information & sources generally isn't a problem for students -- finding quality, reliable sources tends to be more of a challenge. It's important for you to take the time to evaluate the sources you discover in the course of your research. The C.A.R.P. Test is one way of evaluating information, by focusing on the Currency, Relevance, Authority & Purpose or Point-of-View. An important step in evaluating a resource is determining if it is considered scholarly. This distinction will need to be made for books, as well as articles. The online handout Popular or Scholarly? 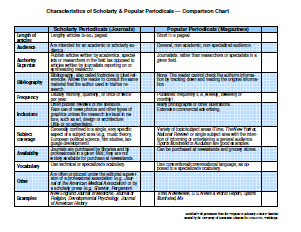 covers the content from the Scholarly vs. Popular Tutorial. If you find that you are still having difficulty, ask your professor or consult with a librarian.